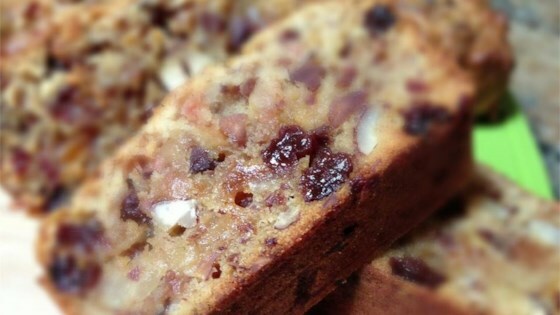 "My mother has been making this fruit cake at Christmas time for as long as I can remember. My whole family loves it. I know there are a lot of people out there that have issues with fruit cake, but this recipe has converted even the most reluctant." Chop pineapple, raisins, and cherries. Combine chopped fruit with currants, orange peel, and citron; soak in orange juice overnight. Preheat oven to 275 degrees F (135 degrees C). Place a small pan of water in the oven. Line one 5x9 inch loaf pan and two 3x8 inch loaf pans with parchment or doubled waxed paper. In a large bowl, cream butter and confectioner's sugar. Stir in beaten egg yolks. Stir in fruit, juice, and pecans. Mix in sifted flour. In a clean bowl, beat the egg whites to peaks. Fold into batter. Fill pans 2/3 full. Bake for 2 to 2 1/2 hours until golden brown, or until toothpick comes out clean when inserted. Sweet, simple tasty cake for a crowd! I followed the recipe to a 'T' and it turned out fantastically. I'm not a huge fruit cake fan but I loved it as did my family. I recommend this recipe to anybody and everybody.